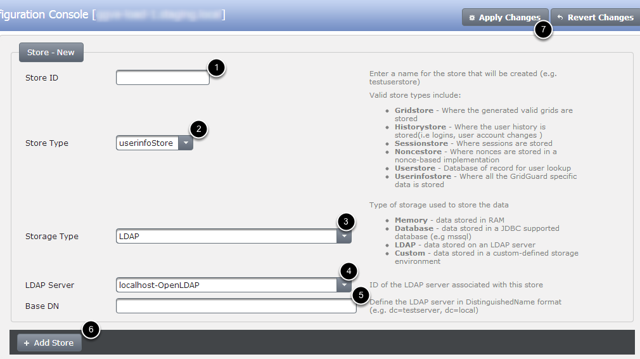 Provides instructions on how to setup a GridGuard User Store and a GridGuard User Info Store. The user store is a store against which lookups are performed to determine if the user is a registered user of the system; the user info store is used to store the PIN, target position and GridPic associated with the user. Typically, both these stores are located on the GridGuard server in the same LDAP OU. The GridGuard server by default comes with a user store (DefaultRealm-2Form-UserStore) and a user info store (DefaultRealm-2Form-UserInfoStore) pre-configured. If you are using the pre-configured stores, you can skip the steps below completely. Follow the steps below only if you want to use a separate LDAP OU to store the user credentials for this integration. This will create a new user OU that will be used to store user information.